If retailers large and small across the UK have their way, then this time next week you and many others will be splashing the cash and scrambling to get the best deals over the Black Friday and Cyber Monday weekend. 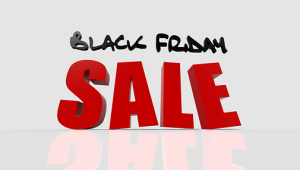 Black Friday was originally intended as a way for retailers to get the most money from consumers on what had proved to be the most popular shopping day of the year, as shoppers loaded up on gifts for the holiday period. Retailers started offering special discounts on this day to entice customers through their doors. As these retailers started to get more and more competitive with their offers, the Black Friday phenomenon was born. Of course, Black Friday was more focused on bricks and mortar stores in its early days. Nowadays, however, more of us are starting to shop online and because of this Black Friday has turned into a bit of an online phenomenon too. This leads us to Cyber Monday. While Black Friday historically proved to be the most popular day of the year for shoppers in physical retail stores, it became apparent that the Monday just after Black Friday was the most popular shopping day for those who preferred to shop online. Not wanting to miss out on an opportunity, online retailers also began to offer big discounts on what became known as ‘Cyber Monday’, as they all vied for your business and your hard-earned cash. Nowadays, Black Friday seems to have become much more than just a chance to load up on gifts on the cheap. These days it is an opportunity for consumers to treat themselves too, with consumers even putting off purchases they would have normally made until Black Friday, in the hope of picking up a bargain. So, are you ready for Black Friday and Cyber Monday? Do you have a stash of cash ready to splurge? If so, then you will need to be at the very top of your game to get a hold of the very best deals. The rewards could be great, but don’t expect it to be an easy ride. Black Friday, after all, is not for the faint of heart. Could Sunday Delivery Soon Become the Norm? Announcing the winner of our £60 Amazon Voucher Giveaway! 2 Responses to Are You Ready for Black Friday and Cyber Monday? Cyber Monday seems like it would be easier to find exactly what you want because you can use the internet and order from anywhere. Thanks for this post. Good read! Black Friday can indeed be stressful so it’s good to have a few tips to keep your head clear. Cheers!